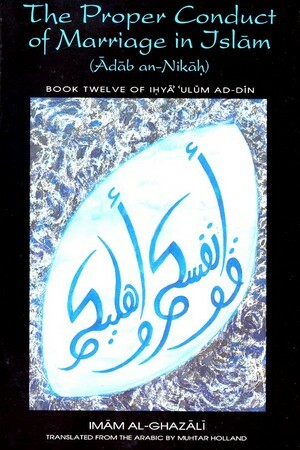 The eleventh chapter of The Revival of the Religious Sciences begins the section dealing with man and society. 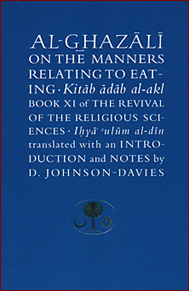 In this volume concentrating on the manners relating to eating, Ghazali first discusses what a person must uphold when eating by himself; That the food is lawful, that both the person and the surroundings should be clean, that one must be content with what is available, and how the person should conduct himself while eating and after eating. Ghazali then proceeds to discuss eating in company and says that to all the above should be added the necessity of courtesy, conversation and the proper presentation of food. Finally, Ghazali expounds the virtues of hospitality and generosity and the conduct of the host as well as that of the guest. Other topics that are discussed are: abstention from food, fasting, and general health. 3) The right conduct of conjugal life from the time of the contract until separation occurs."